The German Sheperd is active, bold, determined and watchful. German Shepherds make excellent watchdogs, as they are naturally suspicious of strangers and very protective of their family. This breed gets on well with children but can be territorial with other dogs. 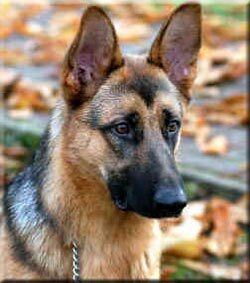 German Shepherds are extremely intelligent and trainable dogs and make ideal household companions. Minimal attention is needed for the coat. During moulting use a comb to remove the dead and loose hairs. It is important that owners do not overlook the fact that German Shepherds are keen to work for their handler and that simply being companions in the home is insufficient. Ideally German Shepherds would be involved in activities such as obedience, agility, police trials or whatever else that can keep them both mentally and physically healthy. It was in Germany in 1899 that the German Shepherd became a distinctive breed. They had been used as guard dogs, but when livestock began being transported by rail and there were fewer wolves, the German Shepherd's abilities had to move into other fields. The most valued dogs were those that could fulfill the greatest number of tasks and due to the excellent versatility of these dogs they became an extremely popular breed throughout the world. Ears: Medium size, broad at the base, set high, carried erect and pointed forward. The ears of the puppies may stay hanging until around 6 months or older and don't become erect until the replacement of the baby teeth. In the past some strains of German Shepherds were nervous, overprotective or had an unreliable temperament, due to inbreeding. However these days after careful breeding these difficulties have been greatly reduced. It is important to buy from a reputable breeder to ensure the dog will have a good temperament. This breed would have to be one of the best known in the world. The German Shepherd has been used as a guide dog and worked with the police, armed services, drug officers and private protection agencies. The German Shepherd is the only breed for which there is a worldwide organization set up for matters relating to this breed.